On Monday, May 21st, 2018, the Sheboygan County Sheriff's Department and the City of Sheboygan Police Department took a number of vehicle entry complaints. The thefts occurred on the north side of the City of Sheboygan and into the Town of Sheboygan. The thefts, which may be by the same suspect, were related to entries of unlocked vehicles during Sunday night, May 20th into Monday morning, May 21st. Items taken include wallets and related contents and a vehicle title. The Sheboygan County Sheriff's Office and the City of Sheboygan Police Department are asking the community for help to identify the suspect(s). The Sheboygan County Sheriff's Department has multiple complaints regarding thefts, burglaries and attempted burglaries over the past year in the Town of Holland and Town of Lima. The most recent report took place in the Village of Cedar Grove, in the 300 block of S. 2nd Street. According to an eye-witness, multiple individuals are responsible for an attempted break-in at this location on April 6th and possibly again on April 28th. The Sheboygan County Sheriff's Office is asking the community for help to identify the suspects. The Sheboygan County Sheriff's Department took a complaint regarding a burglary, at a residence in the 4100 block of County Road D in the Town of Holland. The burglary took place during the overnight hours of Tuesday, April 3rd into the morning of Wednesday, April 4th, 2018. An individual or individuals smashed a window to gain access to an unoccupied residence. An approximate total loss of $2000 in property damage and stolen items were incurred. A yellow and black 14" blade Wacker concrete saw, a Milwaukee hammer drill, a Toolshop brand air stapler, Milwaukee brand Sawzall, a Bostitch nail gun and aluminum fascia were taken. The Sheboygan County Sheriff's Department is asking the community for help in identifying the individuals responsible. On Tuesday, March 15th, 2018, the Sheboygan County Sheriff's Department investigated an overnight burglary to Rathjen Green House, W2509 County Road A, Town of Holland. An undisclosed amount of cash was stolen from the business. 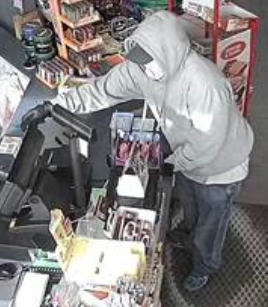 On Sunday, February 18, 2018, at approximately 2:13 PM an unknown male entered the BP gas station at 1312 Eastern Ave, in the City of Plymouth where he brandished a knife and demanded money. The male then, based on witness reports, fled from the store in a northeasterly direction, through yards and possibly to an awaiting, older model silver van. Some of the money believed to be taken during the robbery, was recovered in the vicinity where the suspect had fled. The suspect is estimated to be approximately 5'6" and average build. The suspect wore black leather gloves, grey hooded sweatshirt, a dark-colored baseball cap, jeans and tennis shoes. His identity was concealed by a t-shirt worn over his face with eyeholes cut out of it. On Monday, February 5, 2018, the Sheboygan County Sheriff’s Department investigated a Hit and Run Vehicle Crash to the Little Elkhart Lake Rehabilitation District Septic Lift Station on Lando St., Town of Rhine. A significant amount of damage was caused to an electric box containing the computer components for the pump of the lift station by a truck that left the scene after leaving the roadway and colliding with it. On Friday, February 2, 2018, shortly after midnight, the Sheboygan Police Department investigated a robbery to the J & R Bar, 1823 N. 12th Street, Sheboygan. Two unidentified suspects entered the bar as the bartender was leaving at closing time. The two suspects demanded money from the bartender and left with cash. At this point, the Sheboygan Policed Department is investigating this incident as a robbery. An undisclosed amount of money was taken and no weapon was displayed. Male/White, early 30's, 5'9" tall, 250 pounds, with short blonde scraggly hair, no glasses, clean shaven and wearing a tan or gray hooded sweatshirt and a black baseball cap. Male/Hispanic, approximately 30 years old, 5'5" tall, 150 pounds, with dark brown shoulder length hair and a thin mustache, no glasses and wearing a black winter jacket with a gray stripe running vertically down the side. The suspects had been in the bar previously as customers and waited for the bartender at closing time. The suspects fled westbound on foot in the 1200 block of Lincoln Ave.
On Tuesday, January 16th, 2018, the Sheboygan County Sheriff's Office investigated a burglary to outbuildings at the Sheboygan Rifle and Pistol Club, W765 Rowe Rd, in the Town of Mosel. The burglary is believed to have occurred sometime between, Sunday, January 14th and Tuesday, January 16th, 2018. A Craftsman 30 gallon air compressor, Ryobi drill and two tool boxes containing tools were taken. The total estimated loss is $700. On Tuesday, December 26th, 2017, the Sheboygan County Sheriff's Office investigated a burglary to the Waldo Thrift Store, 827 W Second St, in the Village of Waldo. The burglary is believed to have occurred between the evening hours of Friday, December 22nd and the morning hours of Tuesday, December 26th, 2017. An undisclosed amount of cash was taken from the store. On Thursday, December 14th, 2017, the Sheboygan County Sheriff's Office investigated a forced entry burglary to Kiku's of Tokyo restaurant located at 3709 Kohler Memorial Drive in the Town of Sheboygan. The burglary is believed to have occurred on Wednesday, December 13th, 2017 after 9:30 PM and before 7:44 AM on Thursday, December 14th, 2017. An undisclosed amount of cash was taken from the restaurant.